The French machinery sector has continued its rebound that started in 2014, thanks to stronger growth in industrial production and exports. Value added growth is expected to increase 1.3% in 2016 and 2017 after 1.0% in 2015. 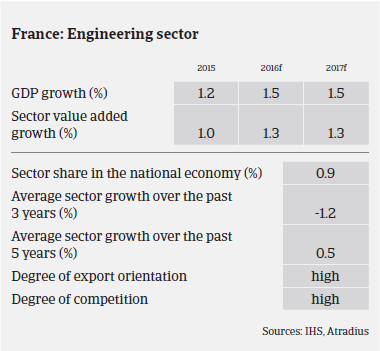 The machinery sector should benefit from the economic rebound in France, with GDP forecast to grow 1.5% in 2016 and 2017, and higher growth of industrial production and exports. More than 30,000 businesses, mainly SMEs, are active in the general mechanical engineering segment (metal forming machines, equipment, precision machines). Turnover and production are expected to increase in 2016 in this main segment as exports remain buoyant and investments in domestic machinery pick up. The export-oriented lifting and handling equipment segment recorded a production increase of 6.5% in 2015. Further growth is expected in 2016 and 2017 due to further rising exports and a modest rebound in demand from the French construction sector. The cooling equipment segment is also expected to benefit from the recovery in the French construction industry, with margins and revenues increasing in 2016, driven by sales volumes, while sales prices are expected to remain stable. That said, in 2015 machinery businesses related to agriculture/farming equipment faced a very competitive environment and decreasing sales and margins, mainly affecting smaller wholesalers. Both sales and production are expected to decrease further in 2016, by 2% and 4% respectively, as farming equipment buyers will reduce their investments due to lower revenues. 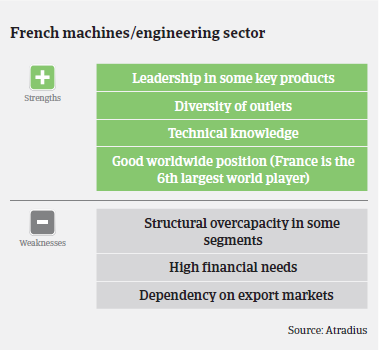 Despite the rebound, overcapacity still remains a concern for the French machinery sector in the long-term. In this capital intensive industry, financing needs are high. As a result, businesses in this sector can incur large debts that weaken their financial structure and overall solvency, putting undue stress on liquidity. 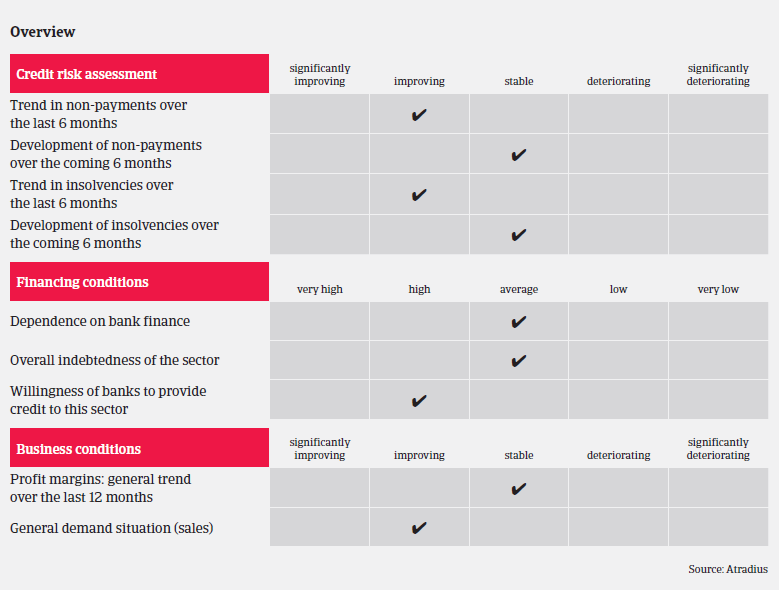 However, in many cases advance payments can improve suppliers’ cash situations, while banks seem willing to lend. On average, payments in the French machinery sector take 70-80 days. The level of protracted payments has been low over the past two years. In 2015 non-payments decreased, and are expected to level off in 2016. That said, machinery businesses selling to construction are still affected by the poor payment behaviour in this industry. The number of insolvencies in the machinery sector is relatively low, and is not expected to increase in 2016. In view of the positive outlook, our underwriting stance remains open, however, we are still more cautious on machinery businesses related to the agriculture/farming segment due to the issues mentioned above.